Windows Live Hotmail had recently launched a feature to connect Hotmail account and FaceBook. It was done with an intention to cope with rising competition from Gmail. 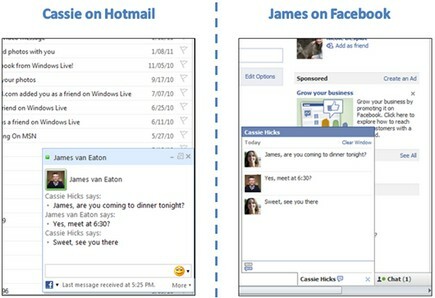 FaceBook Connect allowed Hotmail users to Chat directly with FaceBook friend’s right from Hotmail Inbox and also receive FaceBook updates within Hotmail Profile Page. Until now this feature was only limited to few countries. Today, Microsoft has made this service available worldwide. To activate this service, click on ‘Profile’ located at top right corner of Hotmail Inbox. Select ‘Connect to FaceBook Account’, once connected you will able to Chat with your FaceBook Friends right from Hotmail Inbox. Right now the number of FaceBook Contacts to be imported is limited to 1000 users. This means that if in case you have more than 1000 friends in FaceBook, only 1000 FaceBook Friends will be added to Chat Window.